I was wrong....the blacking out of armour trim is not the most tedious activity in the world...the subsequent re-trimming with multiple shades of gold is even worse. In light of that I've now reached the part of my titan project where instead of batch painting all six at once I will now proceed with one model at a time before moving onto the next. Otherwise having to do five layers of gold on the banding of six individual titans will probably induce suicide!!! For those of you who work on a budget you'll notice from the picture above that the average thumbnail does make a cheap, but remarkably 'handy' palette for mixing paints!! I'll tell you; I have found the most tedious activity in the entirety of the hobby....trying to neatly black out the carapace trim on the armour of six 1980s Titans. It is horrendously dull; and the slightest tremble of the hand leads to hours of repair work being required (especially if this mistake occurs near any areas of yellow chevroning). This task is made even worse when blood starts trickling down your fingers from an open wound in your hand (see previous post for explanation). 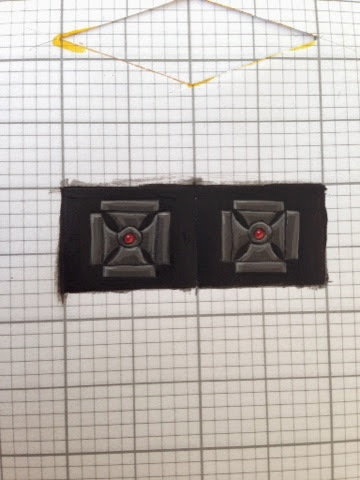 The Reaver was particularly hard to do with it's elaborate fleur-de-lys armour trim, the language that was emanating from my work station would have made a Commisar baulk! I'll update you with any further progress as it takes place!! Well today has been eventful. Whilst weight lifting I dropped a 20kg weight on my finger; this caused the nail to go black with excess blood.... So I broke out my amatuer apothecary kit; heated up a needle and paper clip and lanced them into my nail to release the pressure...the pain was excruciating and the amount of blood that poured out was really quite horrifying!! Unfortunately I had to push this burning hot metal into my smouldering flesh nine times to hit the full amount of swelling which was pretty emotional. 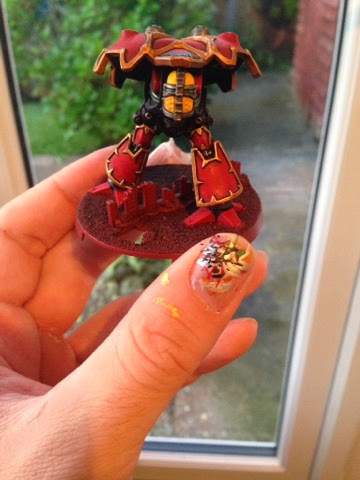 Sadly this high tech medical procedure wasn't enough to deal with it and I had to go to Hospital for an X-Ray and to have another even larger hole drilled through the nail to expunge more blood....by the end of my visit I knew how a dying space marine feels when someone extracts his gene seed. Anyway I still managed to fit in a little painting time; though it was hard to see clearly through the tears of agony!!! 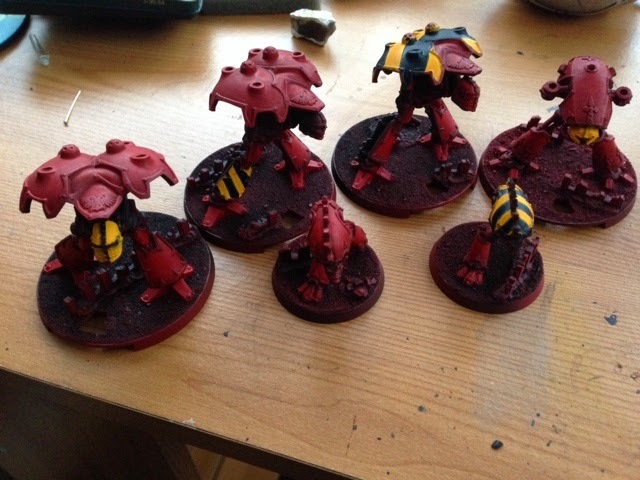 I mainly focused on adding some yellow and black chevrons on different parts of the assorted titans carapaces! Simple; but time consuming due the amount of layers required to build up a solid base colour; the pigment in yellow paint is so translucent! 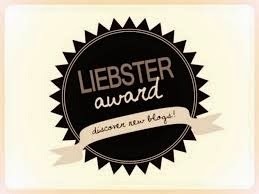 More to follow when my injuries heal! 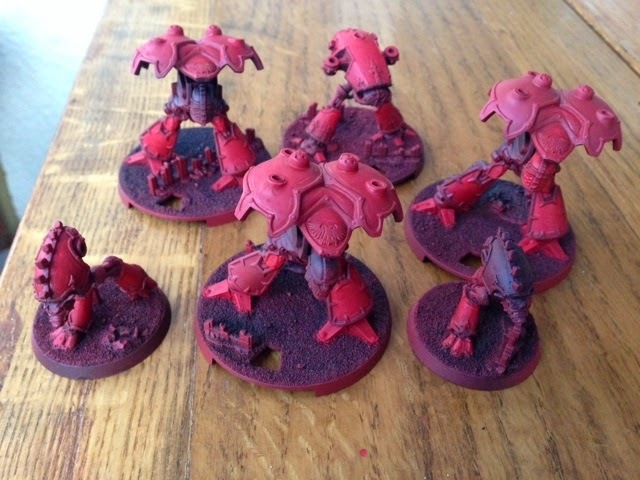 I based all the titans in Chaos black spray then started off with a few solid layers of Mephitson red which I then gradually blended with evil sunz scarlet, eventually highlighting with wild rider red. When this was dry I added a glaze of the new bloodletter.... I'm starting to regret this final layer as while the glaze certainly did emphasise the colours it did obscure some of my gradual layers of shading. Oh well .... Back to the work station! He's force plans are...well...Epic! He's looking at fielding one of each type of ork clan, supported by extra detachments and Gargants.... Gulp! 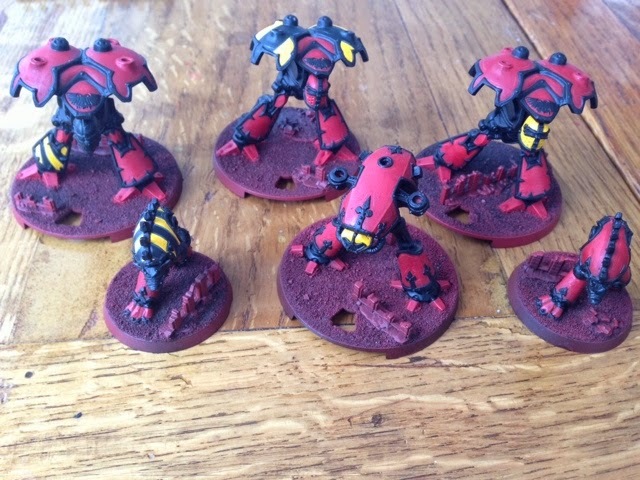 With all this talk of Gargants I decided a bit more armoured firepower was needed to protect my precious infantry and so the Master of the Forge has kindly released a squadron of predators and a battery of whirlwinds to support my sons of Caliban. This should give me a bit of oomph when tackling heavy armour! Two Titans are better than one...so six should be unstoppable. Here we have three 1988 Warlords from the Adeptus Titanicus boxed game, a 1989 Reaver and 2 1989 Warhounds. I've been accumulating these precious artefacts for a few years and this impending clash in August has given me a real impetus to get started on them; so they have been cleaned, prepped assembled and based.... I'll let you know how they go!! 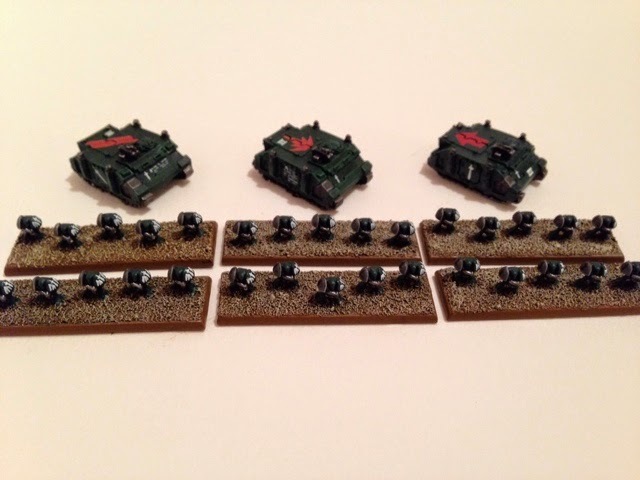 After a few recent posts focused on the joys of 6mm epic I thought this week we should return to a bit of classic 28mm action in the form of a second edition Warhammer 40,000 battle report. Once again my wonderful and very supportive girlfriend stepped up to the platform to take on the mantle of my opponent in this 1990's themed battle. To make a change I skipped the usual retro green battlefield and lichen, instead replacing it with my 6 x 4 urban warscape and associated city ruins. With the battlefield set up the time came for us to begin choosing forces; and so the usual suspects from the Crimson Fists and Salamanders were rolled out to do battle in the name of their Primarchs once again. This weekend I have been engaged in doing some rather dull admin tasks for my job, boring, but sadly this tedium is necessary for me to secure some form of career advancement, so I have knuckled down and stoically cracked on. 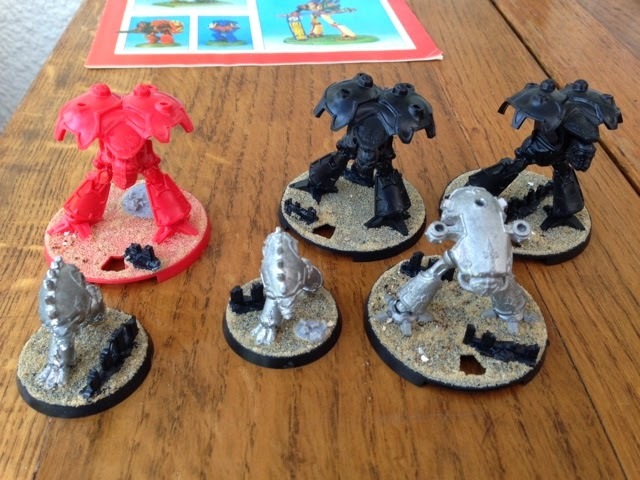 To differentiate my veterans from my standard tactical marines I managed to source some original MkVI marines from the early 1990s as opposed to my usual MkVII marines. I mounted these archaic warriors on the modern long bases so that they fitted in with the rest of the army. Their right shoulder pads were painted stone coloured and emblazoned with a black sword; and as ever I meticulously painted a white dark angels symbol on every left shoulder pad. These guys are very much looking forward to joining their brethren from yesterday's post on the field of war. I witnessed first hand last week how effective my opponent's Veterans were; so I can't wait to surprise him with a few of my own!! Next I'll be looking at painting up a little armoured support for my 6mm battle brothers!! 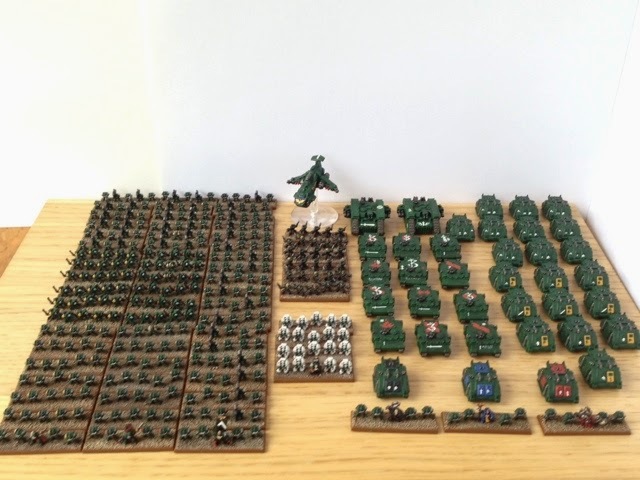 Well after last week's tremendously fun epic battle I was suitably motivated to get off my arse and expand my 6mm Dark Angels army by finishing off a sizable quantity of models that have been sitting on my desk for a while. This task consisted of completing over twenty tiny Rhinos and my renovated Thunderhawk Gunship. Also the interest my post generated last week meant that I wanted to get this article up on the blog for all those people who mentioned that they were thinking of getting back into Epic. 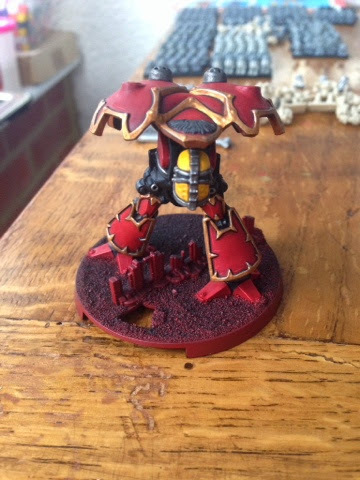 In particular I wanted to get this posted for one of my readers/blog followers (24 Cigarettes) as he had requested to see more of my force in order to motivate the progress of his own Dark Angels Epic Force. 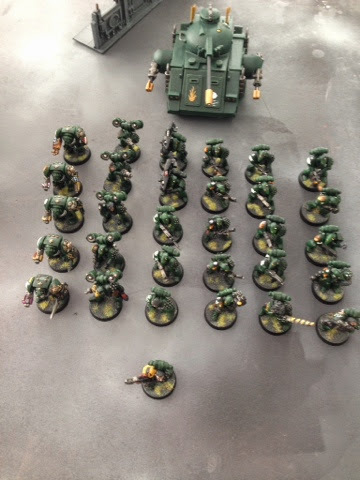 This is my Dark Angels in all their glory (I also have another strike force of Flesh Tearers that is gradually expanding). Currently this force of Unforgiven Astartes consists of two battle companies, a devastator company; a scout detachment; a detachment of Deathwing Terminators and a Thunderhawk. 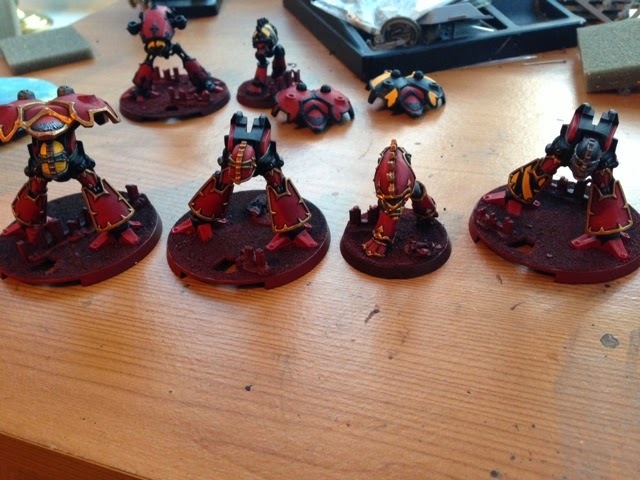 Additionally the line troops are supported by the presence of a Chaplain; a Techmarine and a Librarian. I thought I'd spoil you all with two posts in two days, I'm such a great guy! Today my best mate popped round for a catch up and a game of second edition Space Marine (EPIC). So after the obligatory McDonalds breakfast we set down to some old school gaming. We played our battle on a 5' by 4' table set up with a green felt battle mat, lichen and some retro epic buildings. I won't go into too much detail about this game's set up rules as I covered these in my first epic post last October (worth a read if your new to the 1992 rule set). 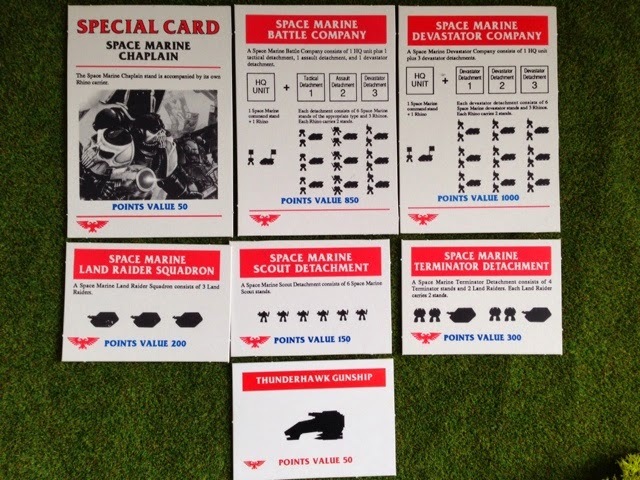 First of all we started by choosing our armies to an agreed points value (2600); this is done by selecting cards which represent units (companies or detachments) and contain the details for the relevant troops and the number of models required. It also has the information for how many casualties this formation can take before it is broken, as victory points are awarded for breaking opposing units this is vital info. A chaplain to lead the force; this character gives all nearby troops a bonus in close combat so he'll be pretty handy as a force multiplier later in the game. Big Green Land Raider rolls off a 1989 Forge World's production line! 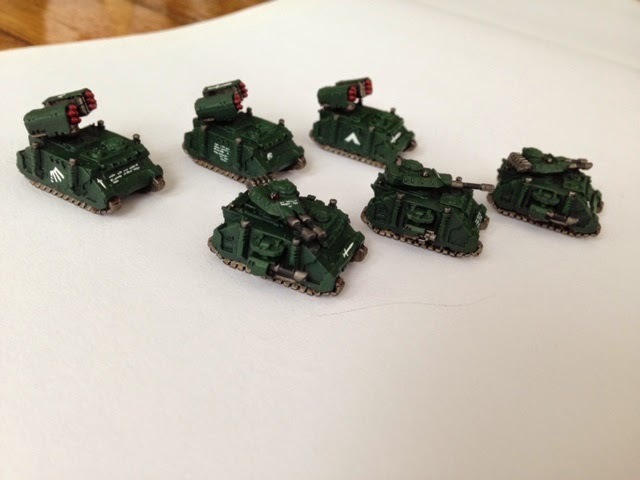 Well due to work commitments my blog and my gaming have been on the back burner for a while; but I have finally got the chance to finish of my Rogue Trader Land Raider for my Old School Salamanders army. This is a project that I have been working on for some time.